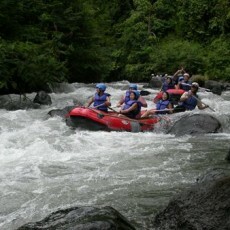 This Tafting adventure will keep your adrenalin high but with lot of Action and fun.!!! Pick-Up: Morning or afternoon, see below. Telaga Waja River is one of the longest river on east Bali start to runs southward Bali from southern slope of Mount Abang. Mount Abang a peak at the south rim of Batur caldera as the nant of tremendous eruption which was probably happened at the same time as other super volcanic eruptions along volcanic belt of archipelago. 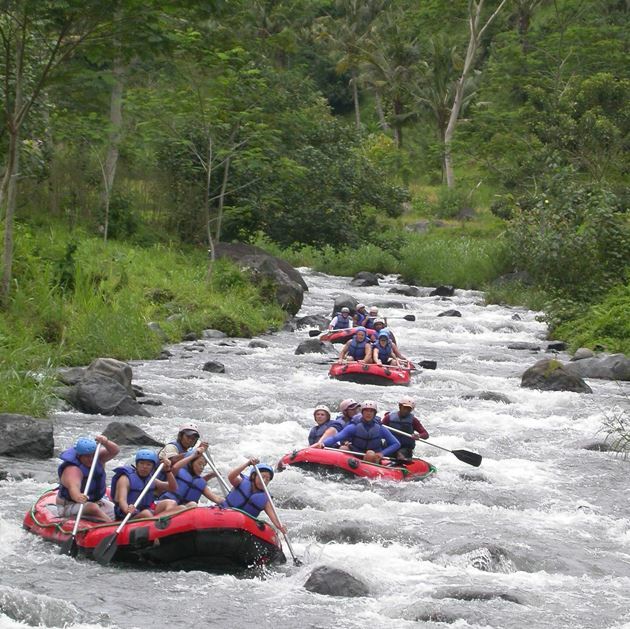 Telaga Waja River is close to the biggest temple of Bali, the Besakih and cut the foot of the highest mountain of Bali that Mount Agung on the west side. 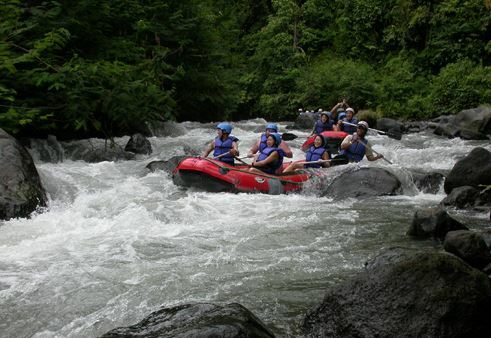 With it’s specific current, clean water, natural views and soft rapid Telaga Waja River has becoming more and more popular among the adventure seekers on Bali to experience the thrill of holidays which combination between culture and nature. 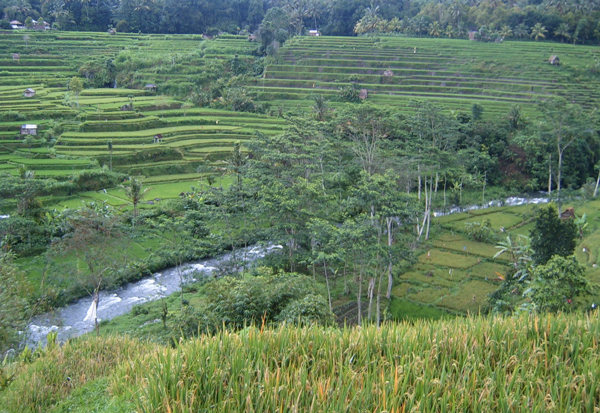 The Telaga Waja, which is considered hold by the local people, is located in perfect spot, flowing 12 kilometres continously through one of the island’s most spectacular rural sceneries. 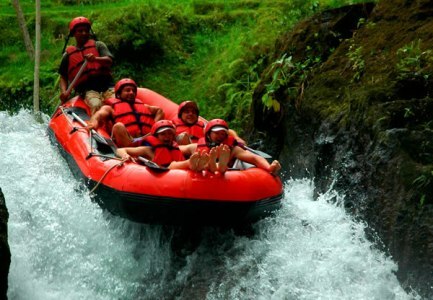 With river categories from class III to IV, there is no doubt that Telaga Waja offers you the real meaning of ADVENTURE which means excitement that you had never imagined during your stay in Bali. At the last part of the rafting journey, you dare to take a unforgettable challenge by ending the adventure by hurtle down a 4 m waterfall at Bajing Dam. Enjoy the ride ! At the last journey., are you dare to take our unforgettable challenge ending your adventure by hurtle down a 4 m waterfall at Bajing Dam at our finish point.? 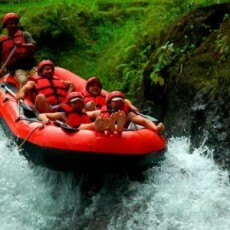 Enjoy the ride and give us all your best to tame the wild dragon on the best river in Bali . 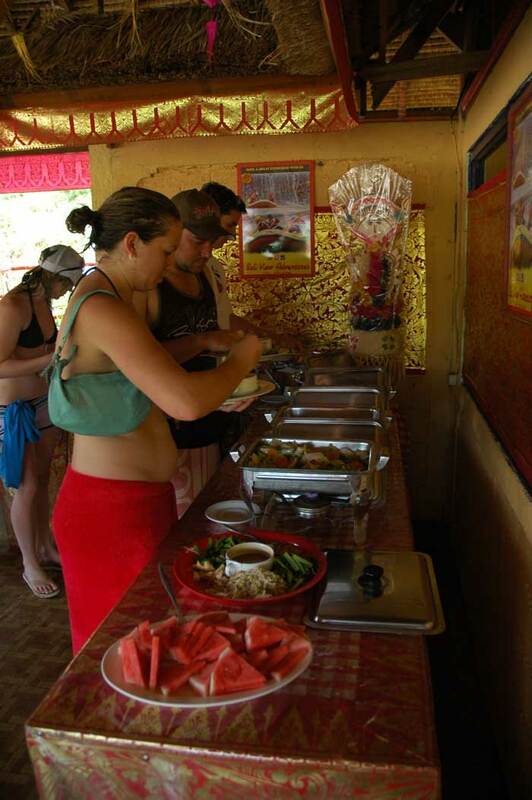 Other advantages that you can get ONLY from Bali View Rafting are the 5-minutes rice paddy walking from the starting point to the river and the short and easy access to the finish point. 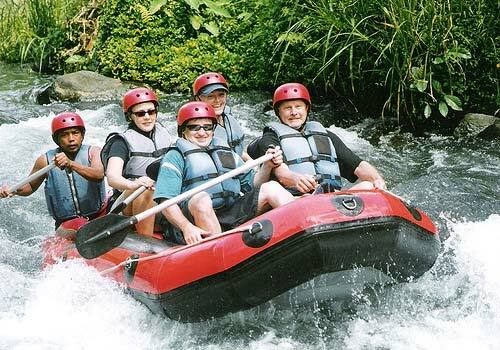 Telaga Waja River is the best rafting point in Bali because the river flows along the expanse of green fields, valleys, hills, cliffs and waterfall of course. 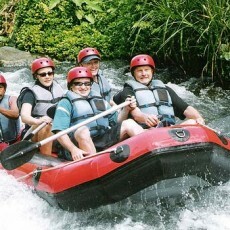 – Rafting’s guides are trained to the highest international standards in safety, first aid, rescue and customer service. 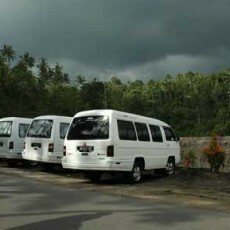 – Surcharge for pick-up at Candi Dasa, Bedugul or Lovina Area: US $ 10 per Person. Special: 1 hour Balinese traditional massage or Aromatheraphy massage in G-Spa Bali, at USD 7 per person when book this tour with us ! !